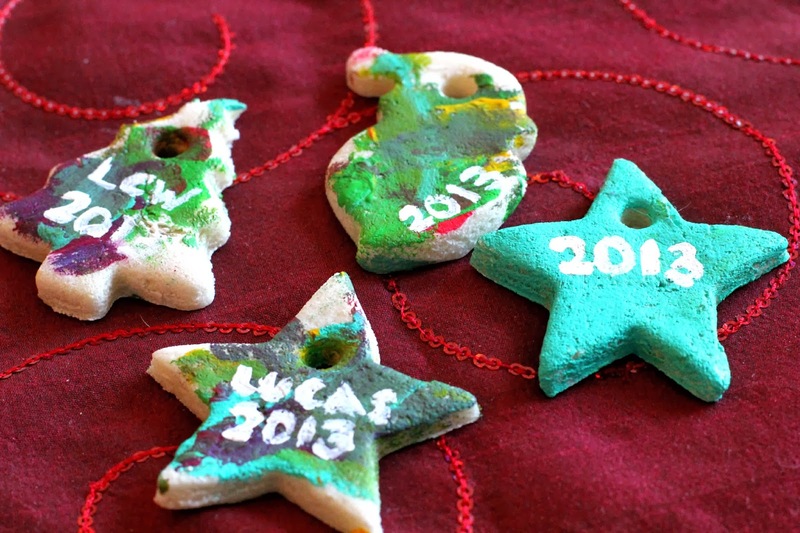 In an effort to do more things with the kiddo in the coming weeks, I snagged an idea from another friend & decided to make some salt dough ornaments for Lucas to paint. And, because one batch of dough makes more ornaments than he would have needed, we decided to invite some friends over! Combine the salt and the flour together, and add water little by little until the dough is well mixed but not sticky. If you feel like it's too sticky, or you added too much water, add a little more flour. The consistency doesn't have to be equally half & half but don't go crazy! Then, roll it out, bust out your favorite holiday cookie cutters, and go to town! Because we are making ornaments, I used a straw to make a hole for ribbon when all was said and done. You want to bake these on a LOW temperature for a long amount of time; I cooked mine on 200 degrees for 3 1/2 hours. At three hours I pulled them out to check, and the back sides were just a tad soft in the middle so I flipped & cooked for another 30 minutes. When they were done, I put them on some cooling racks & they were perfect! My girlfriends came over & we busted out the paints for the three little ones to have some fun with. I have to say, it was a blast. The kids enjoyed themselves & played well together after they were finished. For me, it was one of the best mornings I've had in a long time. With so many of our friends having moved away this past year, my inner circle has shrunk significantly, and with not working my adult interaction is typically limited to my husband and my husband alone. I love the guy, but sometimes you just need some time with the girls. It was nice to chat with some other moms about absolutely nothing and just enjoy the company. And the kids truly did have a great time, which was the whole purpose of the morning! 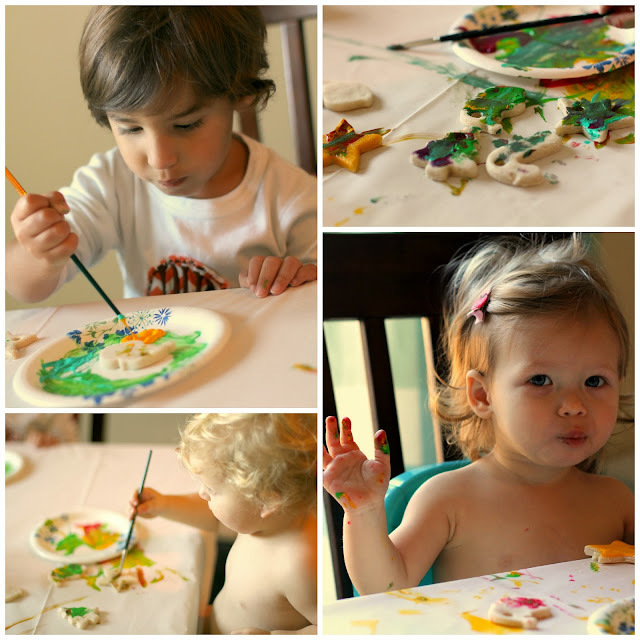 Lucas loves to finger paint, but had never used paint brushes before. As a wannabe artist, I have to say I was proud at how quick he took to it. Like a fish in water! We painted quite a few, and may have to send one or two off to grandparents for their trees next year. But it was truly a great morning. A super easy craft that took no time at all to prepare for paired with great company -- what more can you ask for? !